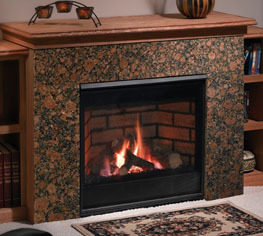 When space is at a premium and a fireplace is a must-have feature, the Aveo is the answer. With its slim profile of just 11-1/2" deep, the Aveo is perfect for a master suite, study, condo or just about anywhere. Though small in stature, Aveo is packed with big features such as a choice of stunning decorative fronts, refractory and a fan. Available in top or rear vented models, all with the industry-exclusive IntelliFire ignition system.